Japan and South Korea was held in Suwon, Republic of Korea on Aug. 25, 2017. 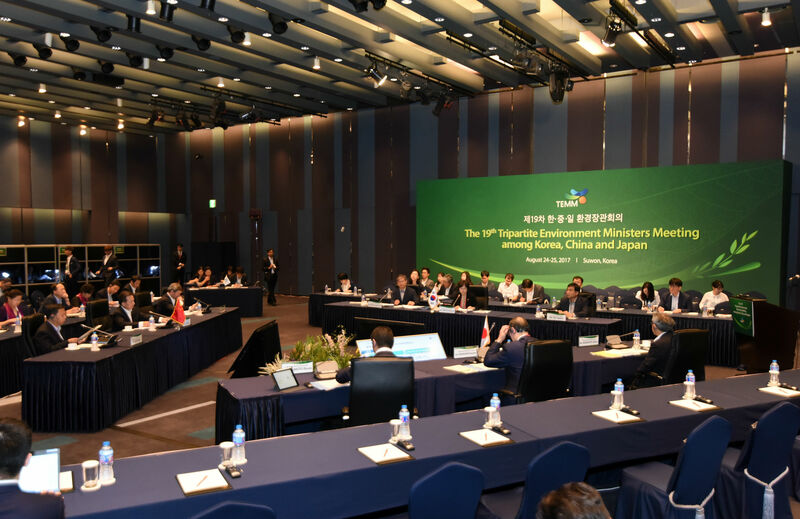 Chinese Minister of Environmental Protection Li Ganjie, ROK Minister of Environment Kim Eunkyung, and Japanese Minister of the Environment Masaharu Nakagawa presented at the meeting as heads of respective delegations. They had dialogues and exchanges on the latest environmental policies of the three countries, global and regional hot issues concerning environment, and the implementation of the joint action plan. Li introduced the progress China has made in environmental protection, under the title “resolutely put up a good fight for ecological conservation and accelerate the development of green development patterns and lifestyles”. He noted that since the year 2012, the Chinese Government has regarded the development of ecological civilization as an integral part for running the country, and proposed and practiced the five development concept-the innovation-driven, coordinated, green, opening, and sharing-based development concept. Chinese President Xi Jinping noted that lucid waters and lush mountains are invaluable assets; that preserving the ecological environment equals to protecting the productivity and improving the ecological environment is tantamount to developing productivity; and that it is imperative to develop green development patterns and lifestyles. These major strategic thoughts have highlighted the extreme importance of ecological civilization in China’s development landscape, and become the new governance philosophy of the Chinese Government. 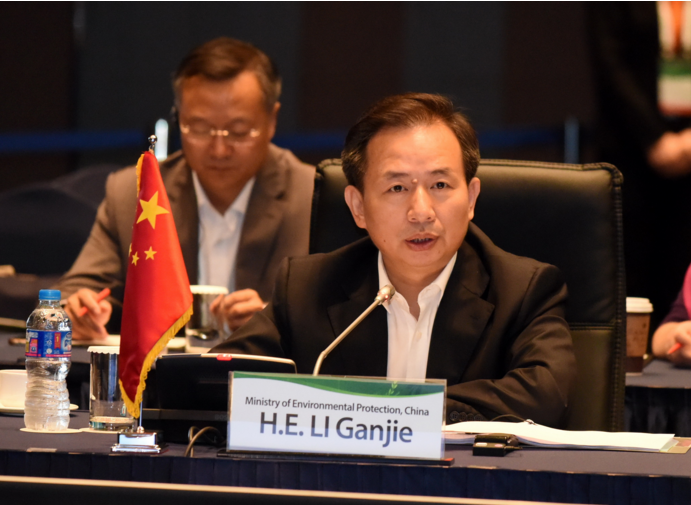 Li said that the past five years have seen China taking the strongest and most solid measures in developing ecological civilization and protecting the ecological environment, which have yielded the most effective results in return at a fast rate, as can be demonstrated by the following five facts: first, the awareness has been unprecedentedly deep. A growing number of local governments have taken the greater green endeavors as an opportunity to advance the economic and social development and eco-environmental conservation. More and more businesses become aware that greater environmental protection efforts are consistent with the long-term development interests. The notion that each and every one is responsible for protecting the environment has been deeply rooted among the people, and green consumption and shared economy have seen fast growth. Second, the pollution control efforts have never been seen before. China introduces three action plans to combat air, water, and soil pollution. The country has the largest wastewater and garbage treatment capacity in the world. Around 15 mil. kW energy-intensive and highly polluting coal-fired power generation units have been shut down, and 500 mil. kW coal-fired power generating units have been upgraded for energy conservation and ultralow emission purposes. The national stage V vehicle emission standard and clean oil product standard have been implemented on a national scale. More than 16.2 mil. yellow-tagged vehicles and obsolete vehicles had been taken out of street between 2014 and 2016. Integrated rural environment management programs have been carried out in 108,000 villages, benefiting 190 mil. rural populations. Third, China has promulgated institutions at a frequency rarely seen. The central authorities have adopted over 40 specific plans for reforms in the ecological civilization and environmental protection arena. The central environmental protection inspection covers 31 provinces (autonomous regions and municipalities), which helps solve a batch of acute environmental problems. Twelve provinces have delineated preliminary ecological conservation red lines. The reform for a vertical management framework for the environmental monitoring, inspection, and enforcement by environmental institutions below provincial level has progressed smoothly. The pollutant emission control permitting system has been introduced, and more than 5,000 thermal power generating enterprises and paper makers are granted with pollution permits. Fourth, the regulation and enforcement has never been stricter. The “toughest” environmental protection law on record entered into force in 2015, which has cracked down on the environmental incompliances in a magnitude never seen before. In 2016, 137,800 environmental cases were investigated, hitting a new historic record. Some of the local governments assemble environmental police force. Fifth, the environmental conditions are being improved at an unprecedented rate. In 2016, the mean annual reading of PM2.5 went down over 30 percent from the 2013 level, in Beijing-Tianjin-Hebei region, Yangtze River delta, and Pearl River delta. The percentage of acid rain coverage has decreased from over 30 percent, a record high, to around 7 percent at the moment. The percentage of surface water sections that reach Grade I~III standard under the national monitoring program has escalated to 67.8 percent, and that of sections that fail the Grade V standard has dropped to 8.6 percent. The water quality of major rivers has been steadily improved. Li stressed that in the next move, China will focus on the environmental improvement and the settlement of pressing environmental problems, and with reform and innovation as the driving forces, protect the ecological environment at all dimensions, in all areas, and throughout the whole process, push for the adoption of green development patterns and lifestyles, and create healthy work and living environment for the people. 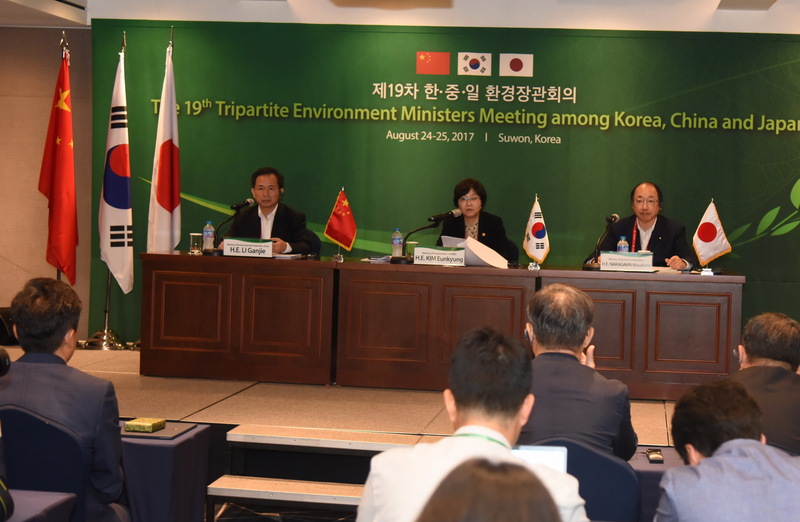 The South Korean and Japanese ministers shared the latest environmental policies in their respective countries. South Korea highlighted the chemicals management, the integrated control of PM2.5, the integrated water resources management, the sustainable development and response to climate change, and other environmental policies introduced by the new government. Japan laid emphasis on the post-earthquake reconstruction, disposal of disaster debris, establishing circular society, and biodiversity conservation. The three ministers also exchanged views on the 2030 sustainable development agenda, the COP 15 of the biodiversity convention, the ecological and environmental cooperation under the belt and road initiative, and other global and regional environmental issues. Li put forward three recommendations: a. move forward with the implementation of the 2030 sustainable development agenda and the development of the green belt and road; b. enable the COP 15 of the CBD to gain substantial results; c. enable the TEMM and the cooperation under its framework to play a leading role in regional development.